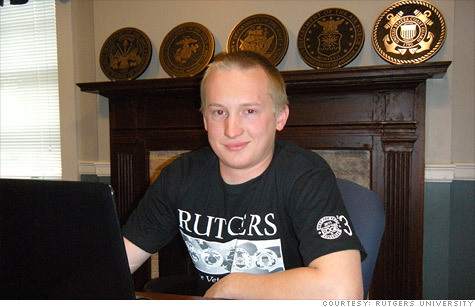 Rutgers sophomore Gary Twerdak, who served in Iraq, is one of 416,000 veterans who enrolled this semester on the Post-9/11 GI Bill. The surge created a bureaucratic backlog for Veterans Affairs. NEW YORK (CNN Money) -- A huge wave of Iraq and Afghanistan veterans have returned to the U.S. in recent months, and that's created a surge of applicants for the GI Bill. Demand for the program has been so robust that it nearly crippled the Veterans Administration's computer processing system, delaying benefits for vets who are trying to further their educations. "This term was a nightmare," said Stephen Abel, a retired Army colonel in charge of Veterans Services at Rutgers, the State University of New Jersey, which currently has 1,107 students on the GI Bill. His office created an emergency scholarship fund of $30,000 for Rutgers GI Bill students who are contending with late VA payments. More than 416,000 veterans have enrolled in school for the spring semester under the Post-9/11 GI Bill, which President Obama enacted in 2009 and made available to anyone who's served in the military since Sept. 11, 2001. VA spokesman Randal Noller said the agency had expected a surge in applications this year, considering that 40,000 Iraq vets came home in the last two months of 2011 alone. But the demand exceeded those expectations. Gary Twerdak, now a Rutgers sophomore, joined the Army just two weeks after graduating high school in 2006, with the express purpose of going to college on the GI Bill after he got out. The 23-year old did tours in Iraq in 2008 and 2009, and left the service in 2010. Now he's going for his bachelor's degree, majoring in psychology with a minor in criminal justice. Ultimately he plans to pursue a career in law enforcement, specifically in counter intelligence and counter terrorism. "From Day 1 in the military, I had a plan," he said. Because Rutgers is a state school, the GI Bill pays his full tuition, and he also gets a monthly housing allowance of $1,763, based on the cost of living in his zip code. Indeed, the housing allowance and the rest of the benefits offered by the Post-9/11 GI Bill are much more generous than those of its predecessor, the Montgomery GI Bill. The new GI bill covers $17,500 worth of annual tuition for private schools and full tuition for public schools; the VA sends the checks out directly to the schools. Students can enroll for up to four years. GI Bill students can combine their military benefits with other forms of financial aid, like scholarships and loans. Unlike the old bill, the new GI Bill can be applied to college or graduate studies, as well as technical schools, flight schools and training as a truck driver, barber or beautician. Another big difference: The new bill is open to not just veterans, but also to their dependents, as well as reservists and members of the National Guard. Since the Post 9/11 GI Bill went into effect, the VA has paid out $17.2 billion worth of benefits to 702,576 beneficiaries. Noller says the agency boosted resources to clear out its backlog of applications, and is now processing 7,000 claims a day. Thirty-three-year-old Greg Adams credits the bill with helping him adjust to civilian life after 10 years in the Army, where he did a stint in the Special Forces as well as tours in Iraq, Afghanistan and the Philippines. 0:00 / 3:20 A farm for battle-weary veterans? "I don't know what I'd be doing without this [program]," he said. "Transitioning right into the work force would be pretty tough." When he left the military last year, he was a major with a bachelor's degree from West Point. Now he's a graduate student at Harvard University, pursuing a three-year program for two master's degrees, one at the John F. Kennedy School of Government and another at Harvard Business School. "I have experience working in the government, and as a soldier, I think there's a perspective that I want to bring to the business world," he said. "I want to work on economic development in growth regions, especially Asia, either as a consultant or entrepreneur." Adams, who is married with one child, is financing his education through a combination of the GI Bill, a fellowship and a scholarship. He also gets a housing allowance of $2,274 a month. For the dual master's program, the student pays Kennedy School tuition for the first year, which is $41,000, and Business School tuition for the second year, which is $51,000. Tuition for the third year is split between the two programs. Between the GI Bill and other financial aid, Adams will end up being responsible for about $30,000 in tuition by the time he gets his degree. That's a lot of money, which he plans to pay off using a combination of loans and his savings, but he's pretty happy with how it's all worked out. "To go to Harvard for three years with $30,000 out of pocket in tuition is a good deal," he said.